- Thu Sep 27, 2018 2:11 pm #527424 I've been watching Airline2sim's excellent videos, he's done an approach into GCTS recently. He flew a VOR approach. In real life.. when would you fly that sort of thing (or an NDB etc)? I'd expect to be vectored most times. Why are they published and who would use them and when. If you see what I mean. I'm sure there are plenty of other answers/opinions also, but I'll take a crack at it from my experience. I am wondering if/assuming you are referring to a full approach (vs. vectoring). Getting vectors to a final approach course if convenient and efficient. However, in many parts of the world, terrain and/or radar placement can severely limit the altitude that radar can "see" you. And in order for an instrument approach to be most effective, it needs to get you down as low as you can go and still safely complete the approach (and landing). So you may be directed to fly to an initial approach fix and get cleared for the full approach, with the radar controller not being able to see you, because your approach may be below the radar controller's minimum vectoring altitude. Another reason is workload; a busy controller may save many transmissions by simply saying "proceed direct SUMFX, cleared VOR ___ approach, report procedure turn inbound." Hope this helps. - Thu Sep 27, 2018 6:10 pm #527433 IAPs (Instrument Approach Procedures) are established at all airports, that operate IFR-traffic. They are the basic way to proceed from an IAF (Initial Approach Fix) to a FAP or FAF (Final Approach Point/Fix). If radar control is available, vectors to take you more efficiently to your FAP/FAF will be more likely. So, in addition to what Don has pointed out - terrain - the fact that radar is available plays a major role. No radar, no vectors. And if you have a radio-failure you will also fly a standard approach according to the IAP. - Thu Sep 27, 2018 6:22 pm #527435 Real life also offers an element rarely found on VATSIM: Mechanical failure of radars, nav equipment and other facilities, which means other procedures must substitute whatever is considered normal. As Don mentions, there are two factors at play here: 1) radar vectoring/sequencing to final approach vs flying the full procedures and 2) flying a non-precision approach rather than an ILS. The former (procedural approaches) are common at smaller airfields where there is no Radar, because perhaps terrain/traffic levels/investment (to give just a few examples) precludes installing radar and recruiting/training/maintaining radar controllers. Many of the Greek islands, for example, have no Radar. With no radar, aircraft have to be procedurally separated which is not very efficient as it relies effectively on position reports from the pilots and time and altitude-based separations -- however, the approach procedure provides a convenient means for that to be accomplished whilst keeping the aircraft terrain safe and within a reasonably compact piece of airspace. Thus, an aircraft can be cleared for the procedure whilst another sits in the hold over the beacon at a higher level - once the first approach is completed the aircraft in the hold can be cleared for the approach and so on. Clearly, using radar to sequence aircraft on to a final approach track is much more efficient for busier aerodromes! A procedural approach, however, could be a non-precision approach like a VOR/NDB etc, or it could be to an ILS. On the other hand, there are some aerodromes where it is impractical to install an ILS. This is often because of terrain concerns -- there are minimum terrain/obstacle clearance surfaces for the glideslope and the missed approach which must be met and terrain can interfere with the ILS signal to the extent that it is not usable. At these aerodromes there may be a VOR or NDB, for instance, that can be used as an approach aid to enable an aircraft to let down through cloud to a position where the pilot can see the runway sufficiently to manoeuvre the aircraft visually to land. Because such aids are less accurate than an ILS and there is no glidepath guidance the minima for such approaches are higher and the final approach track is unlikely to be directly in line with the landing runway. However, it is quite possible to be radar vectored to the final approach track of a VOR or NDB approach just like an ILS if a radar facility exists, but obviously once established on the approach it is then over to the pilot (just like an ILS). When would a pilot choose to fly one? In most modern airlines, generally when there is no other approach available as most specify that the most accurate available approach should be flown, which will normally be an ILS if one is installed and serviceable. Otherwise the order of preference would then, nowadays, often be RNAV if one is available and the aircraft is equipped, then VOR and finally NDB. - Fri Jan 11, 2019 12:15 am #529924 Some airport runways don't have an ILS installed, for various reasons, perhaps relating to terrain, or noise/political issues. Recently, the Australian Government approved an ILS for one of the runways at YBCG (Gold Coast airport.) There were several political protests regarding this decision as having an ILS was seen as increasing the capacity of the airport - therefore increasing the amount of flights arriving there, and people like their towns to be quiet, even if it costs the occasional aircraft running low of fuel having to divert. So with an airport (or in many cases, specific runway at an airport) without an ILS, the only other options used to be to base an instrument approach on another type of navaid. IF there is no navaid at an airport, the only valid IFR approach is a GNSS derived RNAV approach, and not all aircraft are equipped for that. 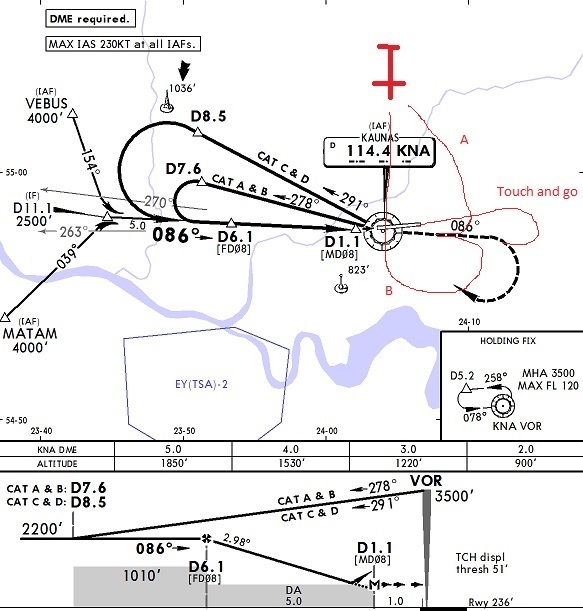 Most airports will have at least a VOR or NDB located at or near the airport, and this can be used as a basis for some kind of instrument approach to at least get the aircraft positioned at a lower minimums than just VFR flight. Useful when there is cloud below several thousand feet ceilings. Now you may think airports without an ILS must be rare. But there's plenty of big International airports out there without an ILS on every runway. Gold Coast - at least till later this year - which receives not only the usual mix of domestic A320 and B738 aircraft, but also daily flights of Air Asia X Airbus A330's, Scoot Boeing 787-8's to name a few. Melbourne's runway 34 has no ILS either, and does indeed have a VOR approach. And an airport you may have heard off called "Princess Juliana Airport." - Fri Jan 11, 2019 3:54 pm #529956 And a more famous example, Kennedy's 13L/R, while equipped with ILS, will often only use VOR/RNAV down to base for a circling approach. I'm not sure if it's noise or EWR/LGA/TEB that is the main factor in this, but it sure is cool. - Fri Jan 11, 2019 5:43 pm #529959 Another thing to consider in addition to all of the above, and given that the field doesn't have anything relative to an ILS approach (LOC, LOC/DME, LOC/GS, etc.) is the weather. If the field in question has a VOR approach (precision, non-precision, or otherwise), but your field is IMC, no amount of vectoring is going to get you down. You're going to need an instrument approach to get you to the field. And the good thing about a VOR approach, is that it would be applicable to nearly all modern equipment types. So if you're flying an aircraft that is /A equipped, you're golden for getting that VOR approach to that field. I think you misunderstood the bit about vectoring: vectoring normally shortens the distance that is needed to intercept the final track of an instrument approach. There are only a few places where you will or can get "talked down". Actually, a proper PAR approach will have similar minimums like a CAT I ILS. - Sat Jan 12, 2019 11:05 pm #529974 PAR is mostly MIL, but you can get SRAs all over the UK if you ever want to be nagged down by someone! The minimums are usually a few hundred feet higher. Magnus Meese 997444 wrote: PAR is mostly MIL, but you can get SRAs all over the UK if you ever want to be nagged down by someone! The minimums are usually a few hundred feet higher. Oh, really, I did not know this (I regularly fly the PAR into EGWU). With the availability of RNP approaches at almost all airfields SRA/SRE approaches will happen even less, since broken nav stations on the ground are not a limit anymore. - Tue Jan 15, 2019 10:47 am #530022 Ha, I enjoy flying PARs/SRAs as well. Northolt is particularly interesting, as you know, due to the proximity to Heathrow, dictating a relatively late line-up with the axis of runway 07. - Wed Jan 16, 2019 10:24 pm #530043 I've heard rumours of huge arrows and text on some industrial roof pointing towards the two ADs somewhere along the final track after someone went for the wrong airport at some point. Not sure if it's still there, though, if it ever was! - Wed Jan 16, 2019 10:51 pm #530044 No, I have never seen them. Which does not mean that they are not there!